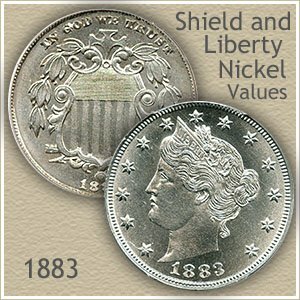 1883 nickel value covers both Shield nickels and the beginning of the popular Liberty Nickel series. All nickels of this date must be examined closely, the Shield nickel as to condition, and the Liberty nickel because two distinct varieties exist. Making this year unique are the many variations. There are Shield and Liberty nickels both dated 1883 and a design modification of the Liberty series within the year. Altogether three distinct nickel designs were minted and today these variations cover a wide range in value. You have a valuable coin. 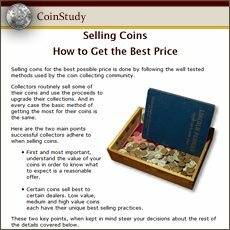 After the variety is established next is to judge the condition of your coin. Grading images, shown below, help determine an accurate value from the chart. Important varieties of the 1883 Liberty nickel are pictured. The new Liberty nickel was first introduced without the word "Cents" on the reverse. Only the large "V" gave any indication of the denomination to the coin and this quickly caused confusion. Not to miss an opportunity, racketeers added to the dilemma by inferring the coin was a five dollar piece. News print of the times tried to clarify the situation and reported the coins appearing with a gold wash (applied by the racketeers) were indeed a nickel and not worth any more. To stop the confusion, as to denomination of the new nickel, the word "Cents" was needed to appear on the coin. New dies were quickly prepared and the second reverse design was soon put into production. Solving the situation, the wording "Cents" continued as part of the reverse design throughout the rest of the Liberty nickel series. Today both reverses of the 1883 Liberty nickel are valued differently and both are needed to complete a collection. Your old nickel values often span a wide range depending on condition. 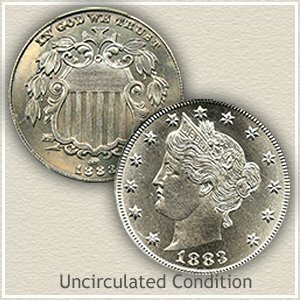 The grading descriptions and images indicate major points of the coin design to observe as you evaluate the condition of your old nickel. Uncirculated: An uncirculated coin shows no signs of wear. The first areas to evidence friction on the Shield Nickel are the Cross and frame of the Shield. With the Liberty Nickel check first the hair above the ear and forehead, wear is indicated by a dulling of the luster. Extremely Fine: In the "extremely fine" grade both series show slight wear. However notice boldness in all design elements. Wear is confined to just the highest parts above the ear on Liberty and the finer details of the frame surrounding the Shield. Fine: At this point a circulated coin has lost most of the finer detail of the design. Even wear covering the entire coin gives a flatness to the appearance. 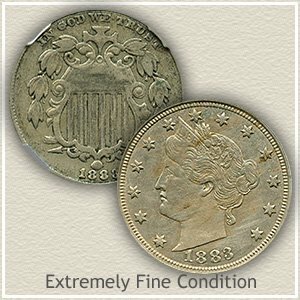 Although major designs are still separated such as leaves on the Shield nickel and some of the hair detail on Liberty. Good: Most detail is missing on these coins, Liberty is in outline form as well as major details of the Shield nickel design. The rims have begun to merge with lettering on each example. Both coins are at the low end of 1883 nickel value. 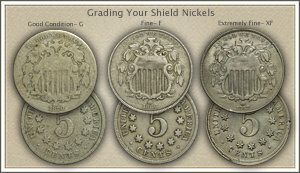 Complete listing of Shield nickel values and larger grading images combine to find an accurate value of all your Shield nickels. Including more relating to your 1883 nickel value. Other nickel series are described, value charts provided and linked to… Liberty nickels, followed by Buffalo nickels and the current Jefferson Nickels.